In a finance and investment banking interview, candidates will almost certainly be asked questions that test their understanding of the relationship between the balance sheet income statement, and cash flow statement. The reason is that on-the-job modeling is heavily predicated on a deep understanding of this relationship. In our self study programs and live seminars, we spend a lot of time talking about how to build DCF, Comps, M&A, LBO, and Restructuring Models effectively in Excel. 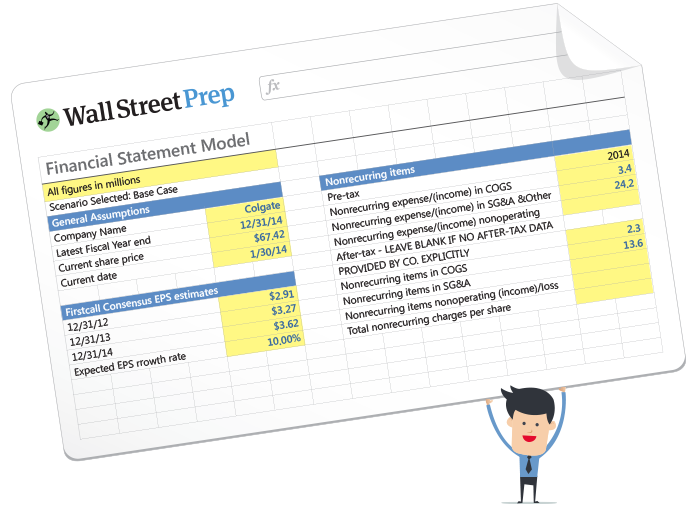 We spend a lot of time making sure that our trainees understand the inter-relationship of the balance sheet, income statement, and cash flow statement because it is so vital to properly understanding these models. Accordingly, we decided to list some basic best practices for projecting balance sheet line items below. As a warning, what you’ll read below is inevitably a simplification but we hope that it is a helpful one for many of you. For complete training on this program, please enroll in our self study program or a live seminar. Imagine that you are tasked with building a financial statement model for Wal-Mart. Based on analyst research and management guidance, you have projected the company’s revenues, operating expenses, interest expense and taxes – all the way down to the company’s net income. Now it is time to turn to the balance sheet. Now unless you have a thesis about a company’s accounts receivable (often you will not), the default assumption should be to link receivables to your revenue growth assumptions. In other words, if revenues are expected to grow 10% next quarter, so should receivables UNLESS you have a thesis to the contrary. Effective modeling is all about building in default assumptions, and incorporating features that enable modelers to sensitize away from those default assumptions. Below is a list of balance sheet line items, along with guidance on how they should be projected. Enjoy! what happens if i want to do this but not on an annual but instead a monthly basis? and then aggregate my monthly forecast numbers to annual? You can still do the same analysis and model structure regardless of whether it's a monthly model or an annual model. For any "days in period" calculation you would use days in the respective month, but can still set up your model the same way. Thank you for the immediate reply Jeff! still, i have an issue forecasting working capital items when the number of days e.g. receivable or inventory or payable days are more than the no of days in periods. let's say i have the monthly model but the inventory days are 76. what is the correct way to forecast inventory or payables when they are beyond 30 days in that case? I would probably forecast inventory and A/P to grow with COGS, as opposed to forecasting them using a "days" metric.